Apple has been building up its regional presence outside of Cupertino, and the United Kingdom appears to be one of its latest targets. The company is reportedly “weeks” away from opening a new office in the university town of Cambridge, UK — news that comes on the heels of Apple quietly hiring five employees from the defunct London-based mapping app Pin Drop. Taken together, the news is also interesting in light of Google’s moves to build up its R&D presence in the U.K. It was only weeks ago that Google announced it had acqui-hired two U.K. artificial intelligence and machine learning startups and was partnering with Oxford University, a longtime rival of Cambridge, on research into the AI field. Those moves build on Google’s prior acquisition of AI specialist Deep Mind, also based in the U.K.
From what we understand, the Pin Drop hires are straight hires — not an acquisition of the app, nor of Caffeinehit, the company that built it. The connection between Apple and Pin Drop — an app that let you bookmark locations and then selectively share them with users — first started to come to light last month, just after the app’s creator, Andy Ashburner, announced that it would be closing down due to lack of funding. That paragraph, and an excited Tweet from one of the employees mentioning that he was moving to Apple, were both quickly deleted that day. Then all went quiet. But we have noticed that since then, four former Pin Drop developers, plus Ashburner, have all updated their LinkedIn profiles to note that they are working for Apple in London (here, here, here, here and here). The jobs range from product designer to Maps data analyst and software engineers. Caffeinehit, the company that created Pin Drop, had also worked on a number apps for third parties, including the Summly app that was eventually acquired by Yahoo, so you can imagine that the expertise goes wider than just mapping — although, of course, maps have long been a focus for the company, and one that they are still working hard to get right after initial stumbles in the wake of a slip from Google to build a more native experience. Apple’s move to take up digs in Cambridge, meanwhile, was first reported today by regional tech publication Business Weekly (via 9to5Mac), which says that Apple is targeting a building on 90 Hills Road, to be used at least in part for research and development purposes. Business Weekly writes that Apple is likely to start with around 20 staff at the Cambridge location with the possibility of increasing that to 40. 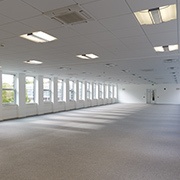 The building has a total of 9,030 square feet of office space across three floors, along with an underground carpark and roof terrace. If accurate, Cambridge is a fitting place for Apple to situate itself. Partly growing out of the presence of Cambridge University, Cambridge is known as a tech hub. Semiconductor company ARM (a partner of Apple’s) is headquartered there; plus others like Qualcomm have have moved in via its acquisition of CSR for $2.5 billion; and dozens of smaller and larger businesses working in both hardware and software cover both Cambridge city proper and surrounding Cambridgeshire. Apple declined to comment for this article, and so did Savills, the real estate agents overseeing the occupation of the space.